Please find below some information about MRSA and the steps you can take to prevent infection. Methicillin-resistant Staphylococcus aureus (MRSA) is a bacterium (germ) from one of the Staphylococcus aureus strains. Around 30 per cent of the population carry it on their skin or in the nose without knowing it and causing no harm to them or others. MRSA is most commonly spread by hand-to-hand contact. It may also be spread by touching bed sheets, towels, cloths, dressings etc which have been used by someone with MRSA. What illnesses can it cause? If the bacterium manages to enter the body, for example through an open wound, it can cause infections such as boils, pimples and impetigo (skin infection). In more severe cases it can cause septicaemia (blood poisoning), pneumonia, bone infections and heart valve infections. It can also prove fatal in the most severe cases. Who is at risk from MRSA? MRSA occurs most commonly with people already in hospital. Patients on intensive care and surgical wards, patients with urinary catheters and those with bed sores and burns are most at risk. MRSA does not normally affect healthy healthcare workers. What is the treatment for MRSA infections? MRSA infections are usually treated with antibiotics (excepting boils or abscesses caused by MRSA which may only need to be drained). However, the choice of antibiotics is limited as most of them will not work. Many MRSA infections can only be treated with antibiotics that need to be given directly into the vein. The course of treatment is often for several weeks. Also, the risk of side-effects with the limited choice of antibiotics is higher than the more ‘usual’ antibiotics which are used to treat non-MRSA infections. The most important thing is good hygiene – always wash your hands with soap and water before and after visiting someone in hospital. If you are a patient, having clean hands is just as important. Use the hospital alcohol rub, which should be available on the ward. If you are feeling unwell with a cold, cough or diarrhoea, stay away until you are better. Ask hospital staff beforehand if it is okay to bring food and drink onto the ward. When on the ward never touch dressings, drips or other hospital equipment. If this is unavoidable always wash your hands afterwards and use the alcohol hand rub. 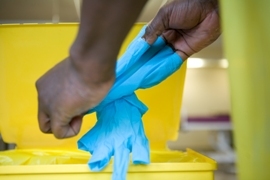 If you think the ward is dirty or you see a nurse or doctor not washing their hands after touching a patient, inform the nurse in charge on the ward. It is in everybody’s interest. The same applies to hand washing if you are visiting someone in their home who has had MRSA confirmed. What precautions do we take as an ambulance service? As an ambulance service we remain fully committed to ensuring that all our patients receive care in a clean and safe environment. We take infection prevention and control seriously and have implemented policies and procedures to minimize the risk of infection. All our staff have been trained in hand hygiene and issued with an alcohol hand rub to ensure they can always clean their hands in between patients. They also ensure that the ambulance is cleaned appropriately after each patient. For more information about what we do to prevent infections see clostridium difficile and norovirus.